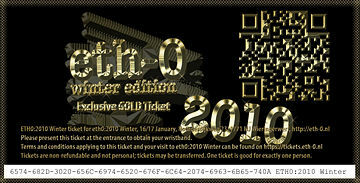 Other pages regarding this event can be found at Category:Eth0:2010 Winter. There are a few very limited gold tickets, that are not fake. You are awarded a comfy golden seat on entrance, so your royal hiney can relax in style. 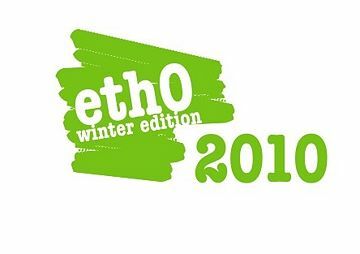 The eth0:2010 Winter Edition has been held from January 16 to January 17 2010 at 't Boshuis in Wieringerwerf. The event lasted two days and was filled with high-tech stuff, lectures, socializing, fun and good food. This is the 3rd time this event has taken place. If you want to visit, tickets are available. <--- Sold Out ! The 2010 Winter Edition has passed, maybe look at Eth0_2010 ? This is a mostly self-organizing event. If you want to add something, have cool stories to share or just want to participate in some other way; you're invited to do so! You can contact us at almost any time on IRC. 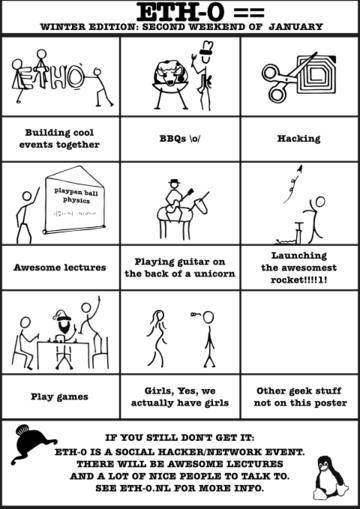 Lets do some cool stuff! Saturday night we will have the PancakeChallenge2010 ! * 10:30 - Doors open. If you want to help out, just talk to the team members and add your name. Boelens Weet nog niet zie wel. BuZz prolly lekker met KingofDos meenerden, maar zie wel epibreren! Stitch Owjah, hij kan ook nog praattuuhhh. En vast wel andere nuttige dingen. Just 80 tickets available ---> sold out! This page was last modified on 18 April 2014, at 10:05. This page has been accessed 37,168 times.